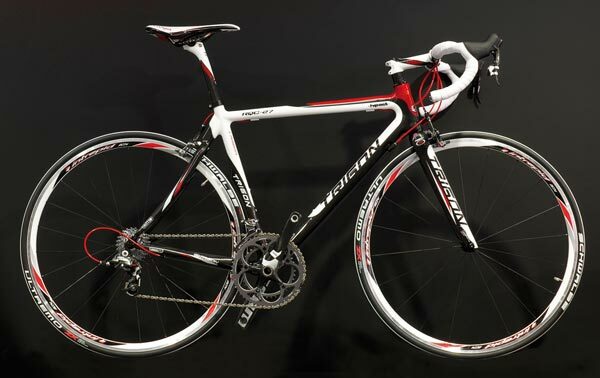 Anyone donating £5 or more to the Dave Rayner Fund before Friday, November 4 2011, will be automatically entered into a prize draw to be in with a chance of winning a Trigon RQC27 road bike worth £2,300. The Trigon RQC27 features a carbon-fibre frame and forks, adorned with a SRAM Force groupset and Intrepid wheelset. The bike was donated by Trigon. Second prize is a pair of tickets to this year’s Dave Rayner Dinner on Saturday, November 12, in Bradford. The lucky winner will get to sit at the top table with a host of stars such as Bradley Wiggins, David Millar and Mark Cavendish. Third prize is a set of RST cycle components, also donated by Trigon. Send your donation, to be entered into the draw, to The Dave Rayner Fund, c/o Bill Holmes, 6 Brookfield Drive, Littleborough, Lancashire OL15 8RH. Cheques should be made payable to Dave Rayner Fund. The Dave Rayner Fund helps riders make the transition to racing on the continent, and has raised £500,000 since its creation in 1996. Among the 300 riders who have benefitted from the fund’s help include David Millar, Bradley Wiggins and Charly Wegelius. The fund was set up in the memory of Dave Rayner, a promising young rider who progressed through the junior ranks to ride on the continent but his pro career was tragically cut short when he died in 1994 at the age of 27.